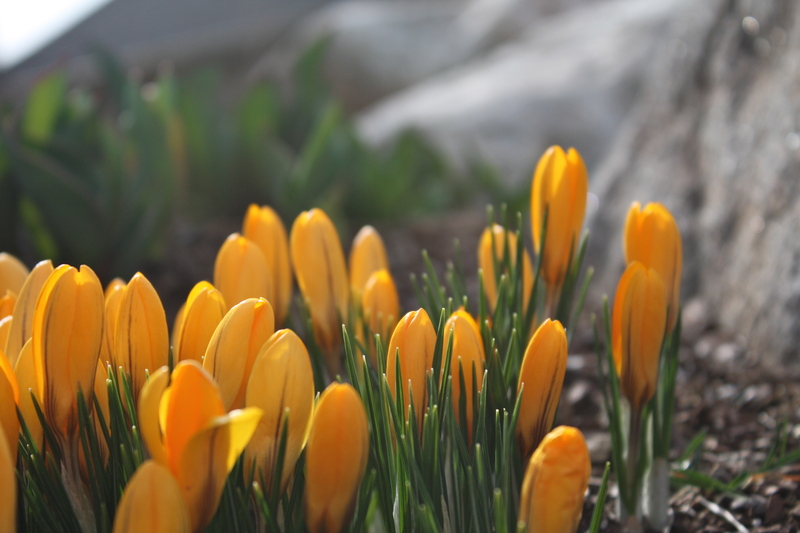 Our crocuses are up. The first sign of spring and one of my greatest joys this time of year. A tiny bundle of light peeking through the snow or the cold-packed earth. Another tiny flower of inspiration is the forget-me-not. 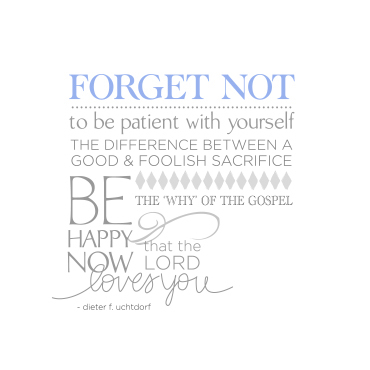 President Dieter F. Uchtdorf talked about the humble forget-me-not flower in this speech a couple years ago (printable version here). It was a beautiful image and a beautiful message. I promptly designed this printable, purchased a bundle of silk forget-me-nots from Hobby Lobby and placed one blossom on each little image. I have been giving them as gifts ever since. Now you can give it as well. 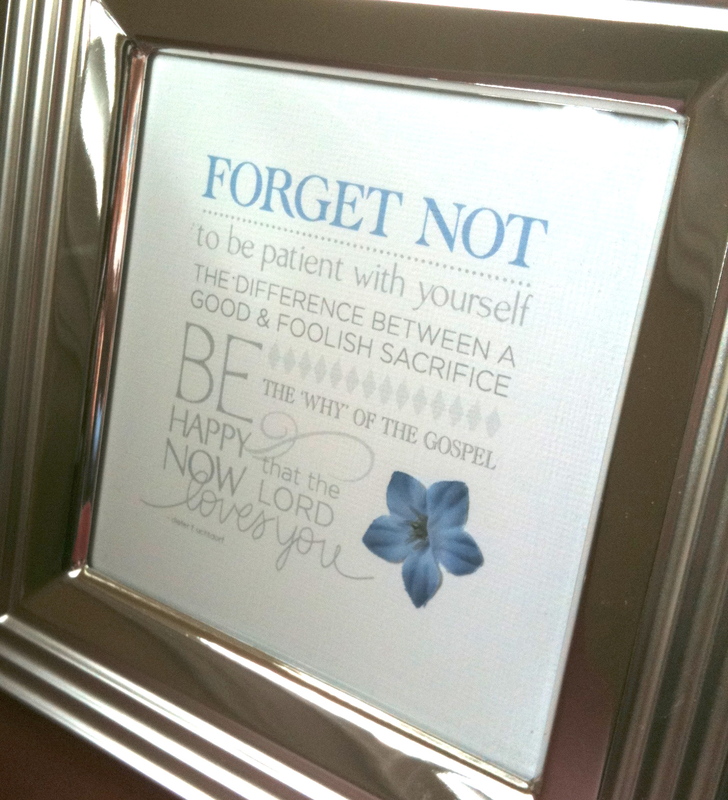 Here are different versions of the Forget Me Not message. Click on each title to download the printable. Here is a non-religious version of the same idea. Five petals. Five thoughts. 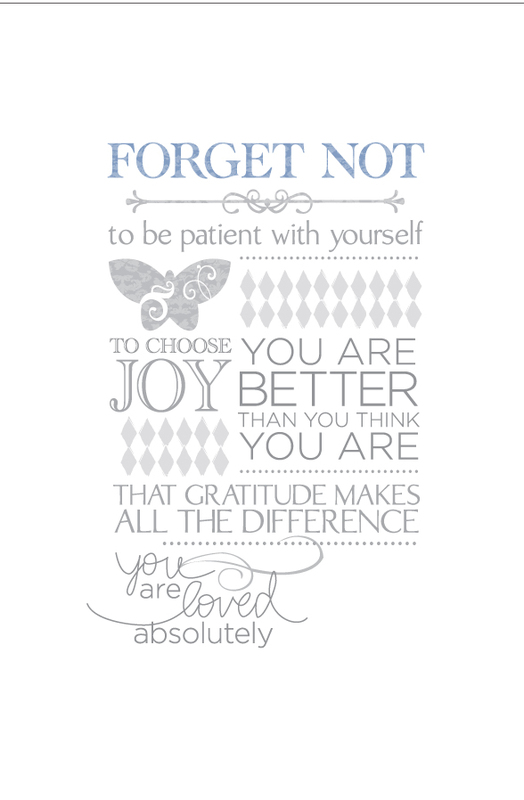 Five things to remember. Just add the petals with your own silk forget-me-not flower. Trim the blossoms from the stem and adhere with a glue dot for stability. The dimensional look of the flower is perfect. I love these words. Whichever version you choose, I hope you love it, too. I need to tell you about my friend. She called and asked if I could help her with this quote because she was doing the 14 Days of Valentines for her husband and wanted to give it to him for one of the days. “It’s a quote from Peeta in The Hunger Games but that’s not why I like it. What a way to be able to describe your relationship! These two are in love. Five children later and a living simple lifestyle, they are madly, happily in love and aren’t afraid to show it. What better words to wake up to each day.Relationships take work. They take fun. They don’t have to be flashy or expensive or filled with gadgets or presents or trips. But the best ones are filled with true love for one another and the ability to think the journey together is fabulous. So, we printed this out on white textured cardstock, trimmed it to 5″x7″ and Amber popped it into this floating frame from Target. She wrapped it up and set it on her husband’s shelf in their bedroom for him to find. What a great thought to wake up to each day. Here’s to loving someone madly. Have a wonderful Valentine’s Day. Each night at bedtime my 3, soon to be 4-year-old son, drags out the inevitable in order to get me to linger longer in his bedroom. “Mom, one more thing!” “Can you get me a drink?” “I don’t want to wear my jammies shirt.” “Mom, I need something.” And a variety of other comments, questions and pleas to keep me in the room. His efforts only serve to escalate my frustration and cause me to pause to count to 10 multiple times over the course of the 13 minutes it takes to actually get him to stop talking and go to sleep. I do love him to the moon and back. And farther. And farther still. So simple and so perfect. So dear reader, it’s your lucky day. 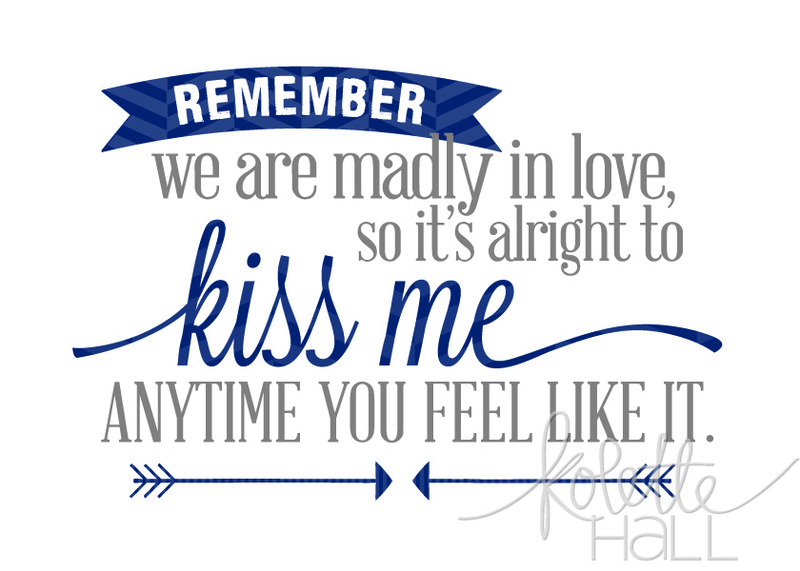 Due to popular demand of this vinyl quote in my Silhouette store, I’ve decided it needs to be made into a printable. Free. For you. Two color choices. Both 5″x7″ size. Actually, they will fit into a 5×7 mat (or frame) or mounted to a 5×7 card. Try it in a 8×10 or larger frame with a mat cut-out to fit the 5×7 image. Use a white mat to give it a little breathing room and it will pack a punch. And check out how the eighteen25 gals used my arrows here. You’ll also love my “Thin Arrows” found here at my silhouette store. Arrows are in – grab them now for all of your Silhouette projects! I was reading over at my friend Brooke’s fab cooking blog this morning as she talked about her father-in-law’s care for her and her family. Of course, it made me want to share a little about mine, too. I talk about my father-in-law a lot to other people. Just yesterday I was telling a friend about what he did to help me through the challenge of Jason’s car accident. He is a strategist. He is an optimist. Therefore, he believes that any problem can be worked through and overcome if you just have a good plan, a good attitude and are willing to work. When Jason had his car accident, he was already a quadriplegic. He was driving his handicap-accessible van when the front left tire blew, sending him across the freeway. He spent 13 months in the hospital and the next 6 years in surgeries, therapy and more hospital time. During those first dark days, it was clear that I needed some help to navigate our way through the physical, emotional, spiritual and mental stress of the situation. Stephen set up a plan for me…what I could and could not do in terms of caring for Jason. He encouraged me to take breaks, go on little vacations and spend only a certain number of hours at the hospital each day so that I could combat the longevity of the situation. The family rallied around to help so that I didn’t have to do it all myself. Mostly, he gave me permission to let go of the guilt that comes from being a caregiver – when you are wondering if you are caring enough. Giving enough. Doing enough. There is always more that you CAN do but I learned that just because there is more to do doesn’t mean I’m supposed to do it. I wish everyone could learn what I did that year. I was 26 years old and I had the blessing of having one of the most empowering lessons of my life engrained into my very character. Because of my father-in-law’s wisdom and nurturing nature, I learned that I didn’t have to do it all. I did what I could and set aside the guilt that I wasn’t doing everything. We women are good at guilt. What we aren’t so good at is working hard and then saying that it is enough and feeling ok about it. I wish everyone had a Stephen Hall in there lives to help them learn that. To lean on and counsel with and go to Thanksgiving dinner with when everyone else in your family is miles away or in ICU. My father-in-law is Jason’s hero and mentor and he’s become one of mine, too. I am certain that I was given the gift of a great relationship with my parents-in-law because God knew that I would need to go arm-in-arm with them to navigate the challenges of caring for a quadriplegic. I love my family – both sides of it. I am lucky to be surrounded by brothers and dads who do all they can to fulfill their responsibilities of being great fathers. This is just one of my thank yous to them. And for you, Stephen, thanks for being the kind of father-in-law that is worth writing about. Recently I went on a quest. As I have been progressing toward better health, I have been trying to organize and prioritize my life again. Cole was 15 months old when I got sick. He is now coming up on the two-and-a-half mark and has turned into a talking, galloping little boy. He needs different things than he did a year ago. I was trying to figure out how to be a work-at-home mom when I have a munchkin who is a constant distraction and delight, wanting to sit on my lap while I am at the computer, constantly needing something cleaned up or gotten out or turned on. If he’s not throwing a tantrum when things don’t go his way, he’s looking for a hug and kiss to remove the bumps and bruises of life. I am a researcher by nature. To solve problems, I like gathering information and then using the bits and pieces that mean something to me to formulate a plan of action. As I faced the dilemma of how to balance my work, motherhood, my health, and all the other things that I have slowly started to merge back into my life again, I began the research process. It was informal but highly trustworthy. I asked other working moms, friends who I admire and want to emulate, what they do to find balance in their lives. How do they make decisions about their time and pay attention to all the things that are important? One friend that I asked this question to, gave a little response, but then said, “Let me know what else you find out. I would love any tips you get!” Which, of course, reminded me that I am not the only one trying to be more successful as a mother or simply as a woman. After gathering information and ideas, anecdotes and experiences from working moms that I trust, I have formulated a plan of action for keeping balance in my life. Here’s what I sorted out for myself. 75% of my existence is taken up by my child and husband with some home responsibilities thrown in. With the final 25% left over to squeeze in work deadlines, church service, and all the other stuff like…read a book or chat on the phone or finish a project. I don’t think that right now, as the mother of a two-year-old, that there is supposed to be an “even” division of my time, with 15% going toward my family and 15% going toward my church and 15% to my work and 15% to my home and 15% to my hobbies…etc. My child is two. He needs attention and help and a playmate and time with his mom. My husband is a quadriplegic. He needs attention and help and a playmate and time with his wife. That’s what matters right now. That is the season I am in. Does this mean I don’t do other stuff? Of course not. But balance right now means something completely different than it did before Cole was born. And balance means something different than what it will probably mean when Cole is in school full time or going off to college. I think that true balance is paying attention to the things that matter most at the time that they matter most. I don’t need to work like a crazy person right now. But I definitely had to as I was building my business a few years ago. So although it was necessary to work my guts out in the beginning, work doesn’t need to take up most of my time at this stage. And here’s the trick…no one can tell another person what is most important at that particular time. I believe that personal revelation from a higher power and our own common sense is what helps us work all that out as individuals. So I’ve decided that balance is in figuring out what is the most important and feeling confident when we are paying attention to those things at each stage of our lives. A little asymmetrical but balanced still the same. I was shocked by the freedom and confidence that this realization gave to me. I’m smart. And I can make smart decisions of how to balance my life appropriately for each stage in my life. This understanding empowers me and gives me courage. And it even helps me be a little more patient as I am interrupted half a dozen times while composing this post to to play “Who Can Eat the Goldfish Cracker the Fastest” game. But just think! If I hadn’t paused to play, I would have missed out on the best little two-year-old laugh six whole times! Enjoy the unbalanced balance, friends. And while you’re at it, the giggles and laughter of motherhood. A warm spring day. Bubbles full of light. Chubby hands chasing something new. Enjoy the sweet, simple things of today.